Just look at it. The F-TYPE Coupe might be the most beautiful car of its kind currently available today. That of course is a personal opinion, but I’d be willing to guess most car enthusiasts would place it in their top five. The F-TYPE Coupe starts at a very reasonable $78,500, although add options to any car in this class and the price can quickly escalate. The R Coupe you’re looking at can be had at $118,500, yet with all extras included it hits the road at a considerable $126,000. Still, price out similar options on a comparably quick premium-badged European competitor and you’ll spend tens of thousands more. Due to its relative affordability the F-TYPE has been high on my list of modern-day favourites since it debuted as the C-X16 concept at the Frankfurt auto show in September 2011, which ended up being very close to the production F-TYPE that was announced in April the following year and arrived in street ready form at the Paris event for September 2012. I’ve since found I’m not alone in my adoration, with the F-TYPE being the second most popular choice amongst premium sports cars in Canada and number one as far as two-seaters go, which is the clearest indicator that its fabulous styling, performance, and value proposition is difficult to pass up. With respect to design, some eye-catching details on this particular R Coupe include Ultimate Black paint enhanced by a completely blacked-out body including its grille surround, hood louvres, front fender vents, and rear fascia trim, standard ground effects that flare out dramatically along the rockers, gorgeous upgraded five-spoke machine-finished alloys with grey painted pockets and carbon-fibre detailing on each spoke, and a standard functional rear diffuser capping off the rear end with four substantive chromed tailpipes poking through for yet more dramatic effect. There’s nothing at all subtle about the F-TYPE R Coupe, its big red brake calipers on larger 380-mm front and 376-mm rear rotors making its ultra-hot performance very clear, if there was ever any question. Most of that beautiful bodywork is shaped from aluminum, as is much of the rest of its bonded and riveted inner framework. This is a major bonus with the brand's other models, such as the new XE and F-Pace, as well as the XF and flagship XJ, because the first three use much more of the lightweight alloy in their construction than any of their segment rivals, but in the F-TYPE’s affordable premium sports car class others are starting to catch up with Jaguar that introduced an aluminum monocoque bodyshell for its second-generation XK way back in 2005. Of course this reduces weight, but more so it strengthens the body to improve handling, enhance crash worthiness, and reduce NVH levels. I’ve never been concerned with quietness while piloting any F-TYPE, mind you, the two previous being a 2014 Convertible and 2015 Coupe in S trim. This means their Roots-type twin-vortex supercharged engine displaced 3.0 litres in its six cylinders while producing 380 horsepower and 339 lb-ft of torque, a bump of 40 horsepower over the more moderately tuned base 3.0-litre supercharged unit, which honestly was more than enough for me until I tried this R Coupe. The R comes stock with 550 horsepower and 502 lb-ft of torque from a glorious sounding supercharged 5.0-litre V8, the two-door hardtop capable of catapulting off the line to 100km/h in a mere 4.1 seconds before rocketing all the way up to 300km/h. I’ll have to take their word for the latter as no track was available during my test, but I can attest to the whack in the back at takeoff, the R Coupe developing speed so intensely that it made me laugh out loud (few cars can do that). Yes it’s true, money can buy joy, at least temporarily, the melodious V8 and bark of its standard quad exhaust pipes and active sport exhaust (which can be switched off for less drama) followed up by incredible bite from the R Coupe’s Instinctive AWD with active power-transfer technology, electronic active differential, sport suspension with continuously variable damping, torque-vectoring brake control, and meaty 255/35-front and 295/30-rear ZR-rated Pirelli P Zero rubber. Set the R Coupe to Dynamic sport mode and let your fingers do the walking via the standard Quickshift eight-speed automatic’s aluminum steering wheel paddles, the wheel itself boasting a thick flat-bottomed leather-clad rim that ideally fit my palms and digits (although if you're not into flat you can swap it out for a perfectly round one at no extra charge). Performance is phenomenal, with instantaneous throttle response and immediate backside-pressed-into-seat acceleration, the R Coupe brutally fast while the sound of gurgling backpressure at each shift point adds to the intensity. The F-TYPE delivers superb feel too, much thanks to a super-quick 14.6:1 steering ratio and wonderful overall balance. It remained perfectly planted within its lane no matter how hard I tried to shake it loose, the AWD allowing up to 63-percent rear bias for stepping out its hind end ever so slightly, but the way it’s set up you’ll have to work hard to hang the tail out. Braking was outrageously strong, with immense stopping power that hardly showed any fade after continual repeated aggressive application. The R Coupe’s dashing good looks extend to the cabin, where stitched, padded leather covers much of the dash in both solid and perforated forms, plus nice available suede-like material atop each rounded primary gauge shroud. The optional Suedecloth wraps down the inside of the unique centre stack buttress, around the lower console, and fills the door inserts too, all before climbing each roof pillar and running across the headliner, or at least the roof’s outer edges as the centre was mostly glass. A panoramic sunroof is standard on the R, with the option being a $3,600 carbon fibre outer skin that would honestly cause me some pause. I love the open ambience of the glass roof on a sunny day, but the CFRP alternative would also improve performance from reduced weight and a lower centre of gravity, while looking stunning from outside. Upon startup the centre HVAC vents power up from the dash, adding some drama to a Jaguar model that substitutes the brand’s usual rotating gear selector, which would otherwise power upwards out of the lower console, with a more conventional lever. Like the alloy paddles on the steering wheel, more genuine metal can be found throughout the cabin, such as the inner door handles that feel as if they’re made from solid billet aluminum. Each dial within the gauge package is ringed with thick metal, while additional aluminum bits include the shifter surround and triangular-shaped Configurable Dynamics drive mode selection toggle, and trim details on the contrast-stitched leather and Suedecloth-enhanced R Performance seats. At least as appealing, gorgeous textured aluminum found elsewhere in the cabin looks as if it will be extremely durable. The seats are amazingly supportive and hardly required adjustment to find the perfect driving position, Jaguar including seat-shaped controls within easy reach on the door panel along with three-way memory for both occupants. You can even modulate the width of both seats’ bolsters via air bladders hidden within. The two-dial gauge package houses a large colour TFT multi-information display at centre, while the standard 8.0-inch InControl Touch infotainment system is nicely done with crisp, colourful graphics, useful navigation, Bluetooth, Jaguar InControl Apps, and more. On that note, when setting the R’s driving modes the options pop up on the screen, plus you can also access a display that lets you time track laps and monitor other performance parameters such as cornering Gs. It’s surrounded with easy access buttons for the phone, audio system, parking sensors, and more. Just below is a chrome-trimmed three-dial dual-zone auto HVAC system with nice rubberized grips, their centres filled with small LCD displays to show individual temperatures, plus seat graphics that allow for three-way cushion heating when pressed. From a practical perspective the F-TYPE offers a lot of space for two up front, while a standard powered liftgate reveals a reasonably large luggage compartment, mine fitted with a nice protective cargo tray. It’s beautifully finished with chromed tie-down hooks and a brushed aluminum sill protector, similar to the aluminum treadplates on the doorsills albeit not optionally backlit. Jaguar even finishes off the liftgate handle in leather with upscale metal fasteners, while a well-made hard tonneau cover falls neatly into place upon closing to shield valuables from prying eyes. All of these details set the F-TYPE apart from mere mortal cars and even many of the more expensive premium sport coupes it competes against, especially when upgraded to R trim, while standard features with this model include most everything already mentioned, as well as HID headlamps with auto high beams and dynamic cornering, power-folding auto-dimming side mirrors, proximity-sensing access via the F-TYPE’s brilliant flush-mounted deployable door handles, pushbutton ignition, an electromechanical parking brake, colour configurable ambient LED lighting, an auto-dimming rearview mirror, rear parking sensors with visual indicators, a heatable power-adjustable steering wheel, rain-sensing wipers, a garage door opener, 14-way powered seats, memory for both occupants, the steering column and side mirrors, impressive 12-speaker, 770-watt Meridian surround sound with satellite radio, and a deployable rear spoiler that automatically rises at 115 km/h, and standard auto start/stop that limits combined city/highway fuel consumption to just 13.3 L/100km (not far off the base car’s 12.6). A $1,750 Vision Pack added front parking sensors, a crystal clear reverse camera with guidelines, blindspot monitoring with rear cross-traffic alert, and closing vehicle sensing, while the previously noted Suedecloth Interior Pack added $1,150, illuminated doorsill treadplates $600, Exterior Design Pack and Black Pack $800, and Blade style forged wheels $2,800, plus a yet unmentioned heated windshield with timer added $400. If you still want more, the R Coupe can be had with a $13,000 Carbon Ceramic Brake Pack that adds a carbon ceramic braking system with yellow calipers, and 20-inch Storm forged black alloys; a $2,750 Red Leather Interior Pack that adds red leather seats and trim; $450 worth of Redzone (red) seatbelts that can only be had with the red leather; and a $2,350 Extended Leather Pack-Upper Environment that covers the roofliner and sunvisors in stitched leather; or alternatively you can opt for the wind in the hair sensation of the Convertible that can be had for just $3,000 more across the entire F-TYPE line. Lastly, you can go all out for the $142k 575-horsepower SVR that sprints to 100km/h in 3.7 seconds ahead of a 322 km/h top speed while adding other niceties as well. There are a number of sports car possibilities at the R Coupe’s price point, but few deliver the same level of knee-weakening styling, indulgent quality and refinement, abundant features, plus shock and awe performance, and none measure up when factoring in price. 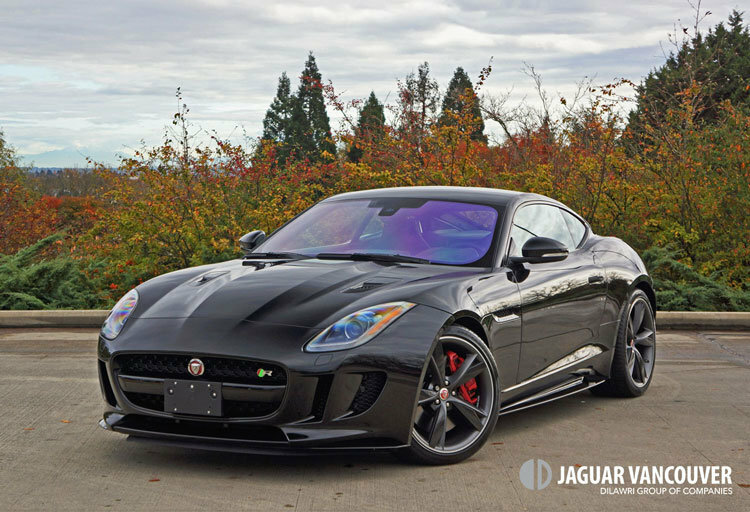 No wonder this F-TYPE is the bestselling premium-branded two-seat sports car in the country.